When it comes to the best shower caddy, rust proof is definitely the way to go. If you are sick of your shower caddy leaving behind rust stains that are nearly impossible to get rid of, then it may be time to switch up and get a rustproof model. We reviewed some of the top rust proof shower caddies, and this is what we came up with. The simplehuman Adjustable Hanging Shower Caddy is our top pick when it comes to all around value and quality, but there are a few others that we really liked as well. 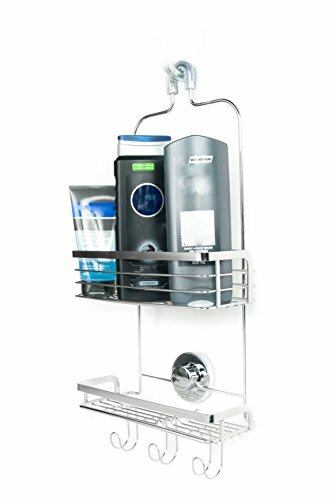 Check out our reviews of this shower caddy below, and the others that we had the pleasure of reviewing as well. First up is the two-tier Vidan Home Solutions caddy. It is made up of stainless steel that is rust proof. It also has three different hooks that help to keep it suctioned to the shower wall. 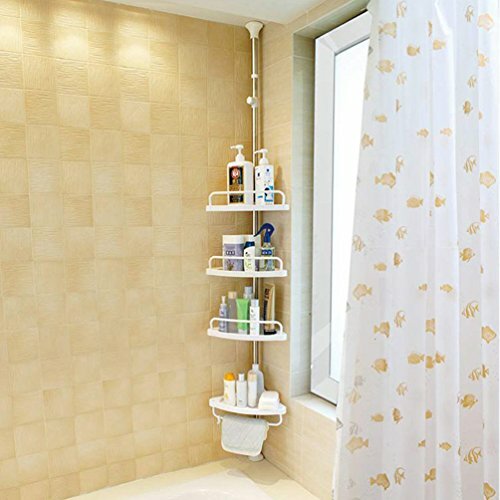 Simply hang it over your shower head, and everything that you will need while showering will be right there. The powerful suction cup keeps the shower caddy from losing its grip. This means that the caddy won’t sway back and forth while you are showering. It is designed to hold up to 25 pounds, making it able to hold just about everything that you need while showering. There are even hooks that make it easy to hang razors and loofahs. The company backs this shower caddy with a full 100% money back guarantee. Love it, or return it! The suction grip will not work well on surfaces that are not smooth. This means if you have granite, marble or stone shower walls, then it may not be a good choice. There is no back to the soap holder, and when you put wet soap down on the tray it may slide off the back or sides. Another great choice when it comes to a hanging shower caddy is this design by simplehuman. It is flexible and can be easily adjusted to fit certain bottles that may be larger than others. It is also equipped with a spot for your razor. This isn’t all that makes this shower caddy great. Check out some of the other features. It has a rubberized clamp that is actually able to be screwed down. This keeps your shower caddy in place better than suction cups and other methods. The soap dish is designed to help the water drip off quickly so that the soap is able to dry out faster. This helps soap to last longer and keeps it from growing bacteria. It is made of a durable stainless steel design that is completely customizable. Shift the shelves up and down and side to side easily. Depending on the shower, this caddy may not rest flush with the wall. This isn’t the case every time and will vary depending on your own shower set up. Some consumers say that after a few years or so that the protective coating starts to wear off, thus allowing it to rust over time. Finally, we have this Zenna shower caddy. This caddy is ideal for people that don’t have too much stuff they like to keep in the shower. If you are a minimalist, then it may be a good option for you. It is sturdily built and has a good design that helps it to stay in place as it hangs from your showerhead. It also has some other noteworthy features. The basket shelves are really actually quite large, which makes it easy to store larger bottles of shampoo, conditioner, or body wash. It has a hook in the middle of it that helps to hold the shower head hose, keeping it from getting in your way while you are showering. It has multiple hooks that make it easy for you to hang up your razors, washcloths, and loofahs. It does not have a soap holder. If you like to use bar soap, then you will need to have a soap dish handy to store it since this one is not equipped with one. There are only four different baskets to put your essential shower items. If you need more space, then this may not be the shower caddy for you. 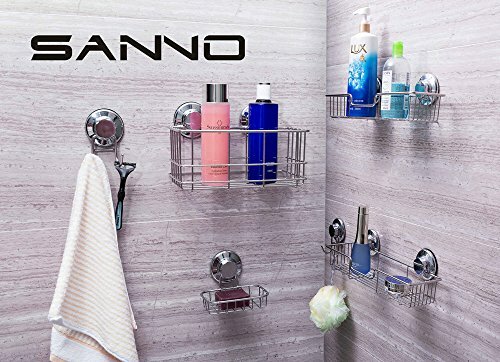 The SANNO Bathroom Shower Caddy is a good product but doesn’t work on all surfaces. So if you want to take advantage of all its nice features, be sure to double check the type of bathroom surface that you have. This will only work for smooth, flat, and non-porous surfaces. These include stainless steel, ceramic tile, mirror, glass, granite, acrylic, laminate, or other surfaces that are glossy and non-porous. It won’t stick on surfaces that are porous or has grout lines – such as wood, granite, wallpaper, unfinished marble, porcelain, painted wall, and natural stones. Make sure your wall is not bumpy. The caddy itself is made of high-quality stainless steel that makes it rust proof, compared to others with chrome plating. While this is a shower caddy by definition, it can also be used in other rooms, such as the kitchen and bedroom. It’s safe to use around the kitchen because it is made of food grade 304 stainless steel. Organize your shampoo bottles, loofahs, soaps, and towels in the bathroom. It holds kitchen tools pretty well, too. The quality of the materials helps keep things in place without falling. Use this for a long time, and you don’t even need to use tools to install it. No drilling and holes on the wall required. Put it up the wall by using the suction cups and adhering them on your wall. This lets you be able to remove and relocate the caddy as you please. Simply twist and lock. The cups come with a 2-year replacement guarantee. The caddy comes with a 180-day money-back and returns guarantee. The Baoyouni caddy pole is made of 430 stainless steel, PP, and ABS. The poles have adjustable sizes. One can go from 6 feet and 8 inches to 7 feet and 10 inches, while the other measures 8 feet and 4 inches and can go up to 10 feet and 2 inches. These are designed to fit any bathroom or shower corner up to the ceiling. The shower caddy is meant to keep all the things you need in the bath or shower. Organize your bottles, soaps, loofahs, and other bath essentials. It fits conveniently in the corner so it doesn’t eat too much space. Arrange your stuff in the four triangular trays, which can be installed with their hooks. These trays can be removed and re-positioned as you wish. Use the four rubber rings to change the height of the trays, so you can make them have a higher gap to accommodate bigger bottles; or make them shorter for smaller items like bars of soap, razors, sponges, or loofahs. The pole, which is rustproof, expands from the floor to the ceiling. Adjust its height so that it keeps a snug fit and maintains its place. Assembly is quite easy, and you can do it on your own. You won’t need tools for this setup. Don’t worry about your walls, either. No drilling of holes is required. Each tray can carry a total weight of 5 kgs, thanks to the anti-skid TPE pad on both sides of the pole. 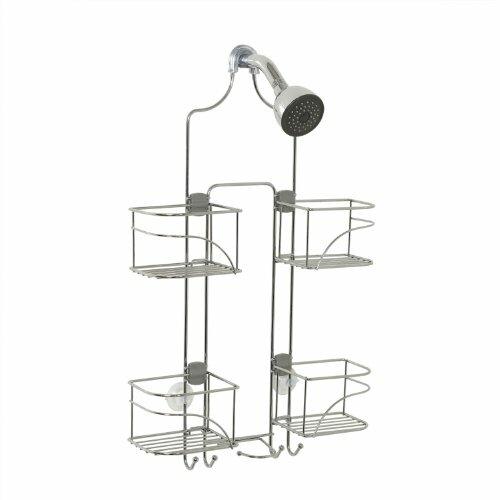 This mDesign Metal Hanging Bath & Shower Caddy includes four swivel baskets, two washcloth hooks, and two suction cups. You can keep your hand-held shower nozzle in the center area, which is left open. The hose will hang down the middle. Items will not be kept moist or grow mildew because of the open design, letting natural air drying and circulation in. The caddy itself is made of rustproof stainless steel. Install this easily on your own. Just hang it over the shower head and you are good to go. You can add traction by using the suction cups to stick it to the wall. Make sure the surface is clean before sticking the suction cups. An instruction manual is included to avoid confusion. It works with baths that have handheld showerheads, including extra large ones that feature a rain style shower. This is also a good RV accessory. This InterDesign Verona Metal Wire Hanging Caddy is designed for handheld showerheads and fixed showerheads alike. The material is completely rustproof, in a stylish silver finish to add an aesthetic look to your bathroom. This can be used for most showerheads in any bathroom in the house. It features 8 wire racks which let you organize all you can possibly need in the shower – shampoos, creams, conditioner, soaps, and more. Keep your accessories – sponges, razors, washcloths – in the lower hooks. The racks are designed to let continuous water drainage to prevent mold and mildew. Soaps and brushes can be kept in the designated bar soap rack. As you look into various different types of shower caddies, you will need to know what you are looking for. One of the first things that you will consider is your personal needs. There are so many styles to choose from. Some offer a lot of storage space, while others may only offer enough space for the essentials. Consider height, size, and style firstly to ensure that you get the space you need. Some of the shower caddies on the market even offer removable sections. You can take out sections as you need them to make it easy to travel with or to transfer from the shower stall to a bathtub. Another important thing to consider is the material that the shower caddy is made of. The materials can range from stainless steel to wood. Just remember, a rust proof stainless steel is probably your best bet since wood and other materials tend to harbor bacteria, leave behind residue or rust, or are just difficult to keep clean. 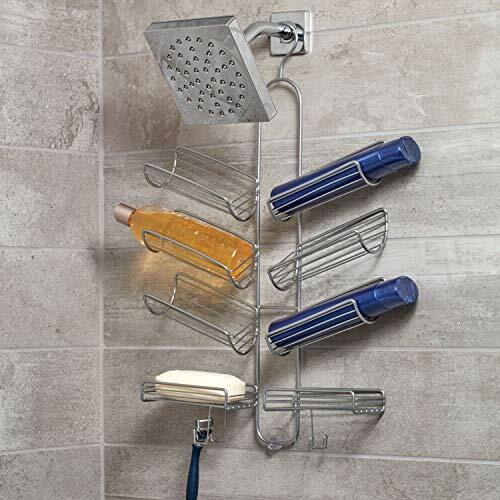 The good news is that there are a plethora of shower caddies for you to choose from, each having its own set of unique features. 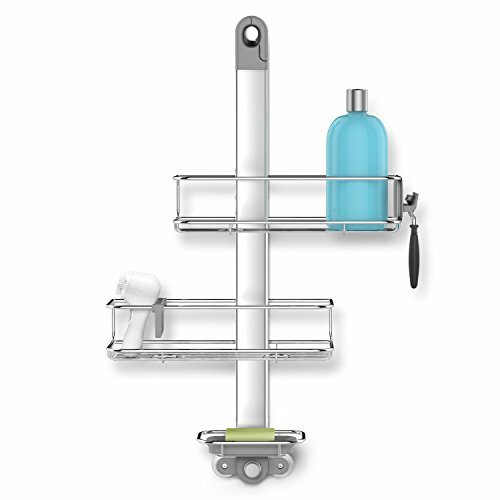 While we do think that the simplehuman Adjustable Hanging Shower Caddy is great, with its customizable features and adjustability, it isn’t the only option for a great rust proof shower caddy. If you are ready to kick the rust to the curb once and for all, then give one of these caddies a try.